We move from an arcade racer with realistic graphics to an arcade racer with decidedly less than realistic graphics. In the wee hours of the night SuperPhillip Central covers the Switch's Chiki-Chiki Boxy Racers. Here's my review. 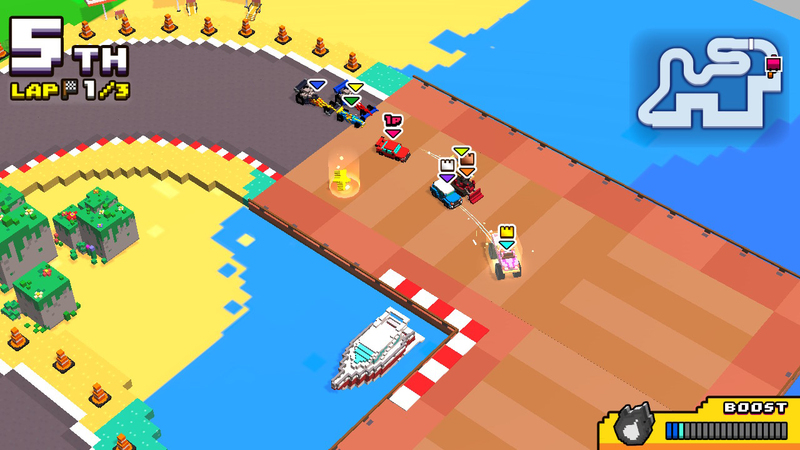 Chiki-Chiki Boxy Racers is a top-down racer hearkening back to the days of Super Off-Road and R.C. Pro Am, to name a couple. You race around circuit tracks, using the analog stick to steer in the direction you wish to drive. It's as simple as holding down to drive downward, left to drive to the left, diagonally to drive diagonally, etc. This is all the while competing against up to seven other opponents, avoiding hazards like walls and oil slicks, and going over boost pads to get a quick shot of speed. Apart from skimming over boost pads, you can also collect boost energy from item capsules to gain a burst of speed upon hitting the X button. Well, it's not called Chiki-Chiki Boxy Racers because everything is made up of spheres! There are three locales in Chiki-Chiki--City, Jungle, and Beach--and each possesses five events total to tackle. As you get gold in one event, the next opens up within the same locale. This is until you clear all four races and earn the opportunity to participate in a Grand Prix event, where you race all four previous tracks one after the other. As you can probably expect from such an event, the player with the most points at the end of all four races is the champion. While you're playing through Chiki-Chiki Boxy Racers and getting gold trophies on each track and Grand Prix, you unlock new vehicles. There are over 20 total to have in your arsenal of automobiles. Each has different stats for handling, turbo, max speed, acceleration, and so forth. Vehicles run the gamut from sports cars and sedans to trucks and tractors. the race leader is feeling some "pier" pressure. Aside from the 12 tracks and 3 Grand Prix events in Chiki-Chiki Boxy Racers, you're limited in what else you can do as a solo player. You'll quickly unlock all of the aforementioned vehicles in less than an hour, as the AI doesn't put up much of a close race for the most part. The little else there is comes in the form of mini-games that task you with getting as high of a score or as quick of a time as possible. Now, these mini-games are pretty creative, offering things like driving over concrete--trying to paint over every single patch of ground possible quickly--or something as simple as attempting to get as many goals in a vehicular soccer game as possible against an empty net. There is also the option to play online against friends and randoms, but considering how dead the online was when it was free, I shudder to think about trying to find anyone to play Chiki-Chiki Boxy Racers with now that the online is gated behind a Nintendo Switch Online subscription. as possible before time expires in this mini-game. Local multiplayer doesn't fare much better either, and it's for the silliest of reasons. The competitive mini-games don't suffer here, and they're actually a lot of fun with another player. It's when you get to the traditional racing that the experience goes awry. Players in local multiplayer share the same screen, and since tracks don't just fit all on one screen, there's obviously some form of split-screen multiplayer, right? Wrong. 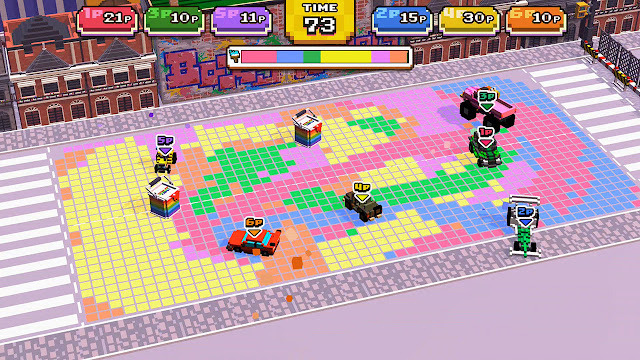 Instead, Chiki-Chiki Boxy Racers has it where all players must stay on the same screen together. If someone straggles behind, they're put a short distance behind the player in first place. Maybe this is obvious, but that can result in some really lame and unearned comeback victories. It got to the point where my local multiplayer pal just stopped racing seriously until the final stretch, and then he'd get transported close to me after being too far back and pass me for the victory. Neither of us enjoyed ourselves with this, and it's baffling to both of us why the multiplayer was designed this way. 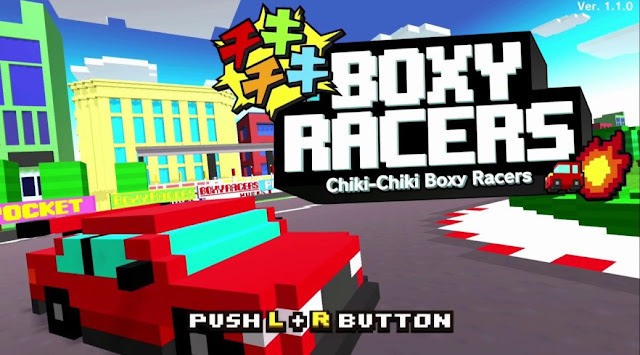 Chiki-Chiki Boxy Racers is a fun game--don't get me wrong. However, it's substantially small amount of content and little replay value make for a game that's difficult to recommend. 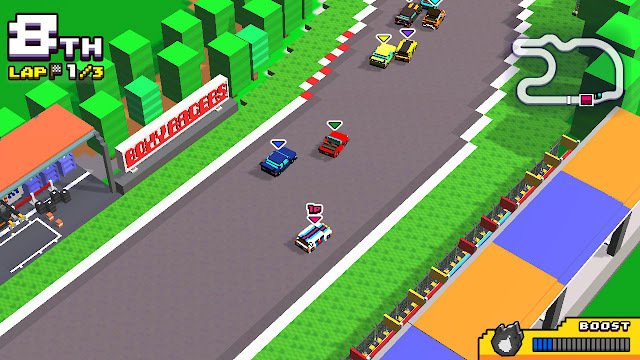 The halfhearted way multiplayer was implemented cuts the legs out from under this otherwise enjoyable arcade racer. While Chiki-Chiki Boxy Racers could have crossed the finish line in first place, it instead gets caught with a flat tire on the homestretch.